Sheet 10" x 10" (254 x 254 mm). Press down firmly to adhere substrate to film. No heating is required. Ideal for holding down silicon wafers, alumina, or glass substrates for scribing. Dissolves in acetone or MEK. 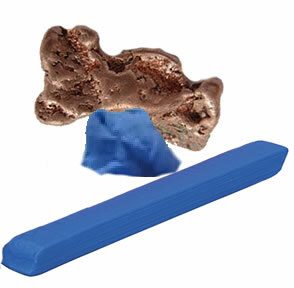 Blue plastic, non-hardening putty easily positions difficult materials at the angle you want to examine them or holds items in place during specimen preparation. It's like having an extra hand in the lab! Easily moldable and reusable, the putty will not permanently stick to solid samples or mounts. The blue color offers excellent contrast to most materials under the microscope. Contains odorless acrylic. This temporary mounting wax is used in a variety of applications to bond samples during a processing application. After processing, the mounting wax is washed away in acetone leaving no residue. Thermoplastic polymer. Softening point is 71°C (160°F). Flow point is 135°C (275°F). Viscosity at flow point is 6,000cps. The color is crystal clear and it dissolves in acetone. 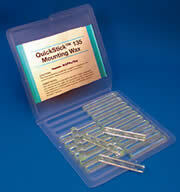 QuickStickT comes 20 sticks/tray and it weighs approximately 350 gram. Each stick measures 3"(L) x ¼"(W) x ¼"(H) (76 x 6 x 6 mm). MWH080 is an amber colored wax, which is translucent in thin films. High hardness makes it ideal for sawing, ultrasonic cutting and lapping & polishing operations. Best suited to vitreous materials, polished metal surfaces, semiconductors and piezoelectric materials with large contacted areas. Chemical resistant. 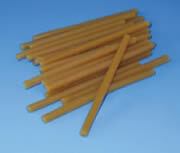 100 Gram/Pkg of 4 sticks .5" x .5" x 7" long (12.5 x 12.5 x 175 mm). Hard hardness with a Melting Point of 80°C. Dilutent: Ethanol and Acetone. Mounting Wax 70 is a quartz type sticky, orange colored wax (translucent in thin films) used to hold crystals or other materials while they are being sliced, lapped or polished. Moderate hardness and strength make it useful for bonding small samples in diamond wheel sawing and wire sawing operations. Widely used for holding semiconductors, optical materials, ceramics and metals with medium to large contact areas. Chemical resistant. 100 Gram /Pkg of 29 sticks, .25" dia x 4" long (6 mm dia x 100 mm). Moderate Hardness and a Melting Point of 70°C. Dilutent: Warm soapy water. 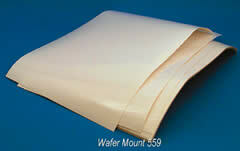 MWS052 is a tan colored wax, which is translucent on thin films. Softness makes it most useful with abrasive slurry cutting of materials. 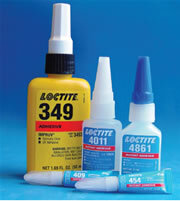 Best suited to non-porous surfaces such as glass or polished metal with a reasonably large area. Easily soluble in a variety of solvents. 113 Grams/1 Stick, 1" x 1" x 7.5" long (25 x 25 x 190 mm). Soft Hardness and a Melting Point of 52°C. WaxStrip™ is an environmentally safe powder compound prepared primarily for the removal of mounting waxes in semiconductor processing. WaxStrip™ is compatible for use on silicon, glass, iron, aluminum, zinc, brass, copper, magnesium and other materials. 1 lb/bottle. For a general-purpose gel adhesive, clear, gap fills 0.010"; surface insensitive Ethyl, tensile shear strength 3,200 psi, and temperature range – 65°F to 180°F. Cure speed: fixture - 75 seconds, full - 24 hours. For use with porous surfaces, clear, gap fills 0.010", surface insensitive Ethyl, gel type, tensile shear strength 3200 psi, temperature range – 65°F to 180°F. Cure speed: fixture – 15 seconds, full - 24 hours. For use with flexible surfaces, clear, gap fill 0.008", surface flexible Alkyl, viscosity 4,000 cP, tensile shear strength 2465 psi, temperature range – 65°F to 212°F. Cure speed: fixture – 25 seconds, full – 24 hours. For bond glass/metal, appearance: clear/straw, cure type: UV, viscosity: 9,500cP, shore hardness: D70, temperature range – 65°F to 266°F. Chemical type: Ethyl cyanoacrylate, transparent, colorless to straw colored fluid. One part required no mixing. Low-viscosity (100 cP). Cure by humidity, and temperature range – 65°F to 180°F. Has a refractive index (nD @25°C) of 1.539 and an Abbe V dispersion of 45. Its optically similar to Canada Balsam and therefore ideal for mounting many biological specimens but without the long drying time of Canada Balsam. It has a refractive index (nD @25°C) of 1.582 and an Abbe V dispersion of 33. Its optical clarity makes it the preferred choice for minimum visible absorption. It has a refractive index (nD @25°C) of 1.605 and an Abbe V dispersion of 30, making it appropriate for mounting Asbestiform Tremolite, Anthophyllite, and Actinolite. It has a refractive index (nD @25°C) of 1.662 and an Abbe V dispersion of 26, optically similar to Aroclor 5442 but is PCB-free. It has a refractive index (nD @25°C) of 1.680 and an Abbe V dispersion of 25, making it appropriate for mounting Amosite and Crocidolite asbestos. It has a refractive index (nD @25°C) of 1.704 and an Abbe V dispersion of 24, similar to Naphrax.